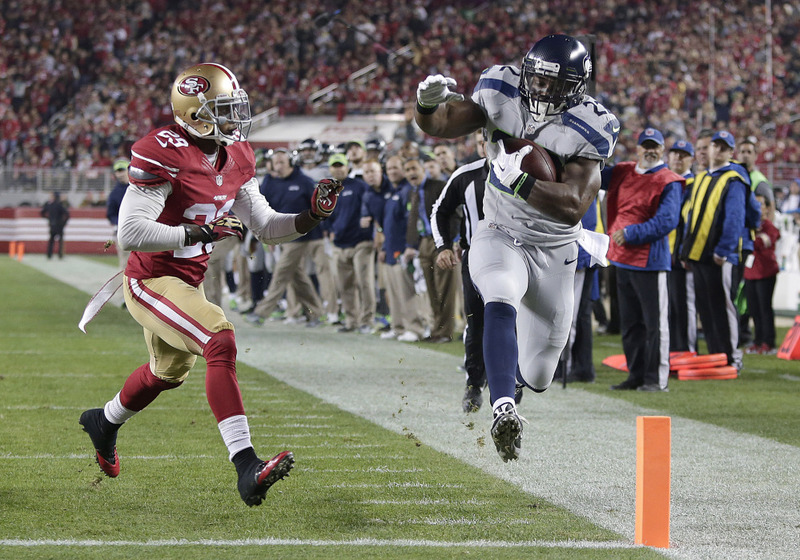 The 49ers are held to three points or fewer for the first time since a Week 2 loss to the Seahawks last year. SANTA CLARA, Calif. – Richard Sherman provided the moment of the game against the 49ers once again, a mere 10 months after his touchdown-saving deflection in the NFC championship that sent the Seattle Seahawks to the Super Bowl. Sherman set up the only touchdown with another key defensive play in this heated rivalry, then made a second interception with the 49ers driving late, and the Seahawks ended a five-game losing streak on San Francisco’s home field with a 19-3 win Thursday night. The brash cornerback offered plenty without opening his mouth this time: Blowing kisses to the crowd, then putting a finger to his lips to make the hush sign before waving goodbye. Steven Hauschka kicked four field goals and the Seahawks’ stout defense held Colin Kaepernick and Michael Crabtree in check as Seattle (8-4) overcame 14 penalties for 105 yards, including an offensive pass interference that negated a touchdown. Russell Wilson passed for 236 yards and thoroughly outplayed Kaepernick, who had one of his worst performances for the 49ers (7-5) in a game with high stakes for the teams’ playoff hopes. “Their fans were saying some pretty vulgar things to us earlier, you never want to hear that,” Sherman said. San Francisco’s offense might have earned that distinction after its latest dud snapped the Niners’ three-game winning streak. Sherman got things started when he intercepted Kaepernick’s deep third-down pass on the right sideline in the first quarter to help set up Wilson’s 13-yard touchdown pass to Robert Turbin. A wide-open Turbin easily took the ball down the left sideline on a pretty catch-and-run before beating cornerback Chris Culliver into the end zone. Phil Dawson provided San Francisco’s lone points on a 40-yard field goal late in the third. “We’ve got to reboot, come back and win them all,” Harbaugh said.